Prices have risen significantly following lows last spring. 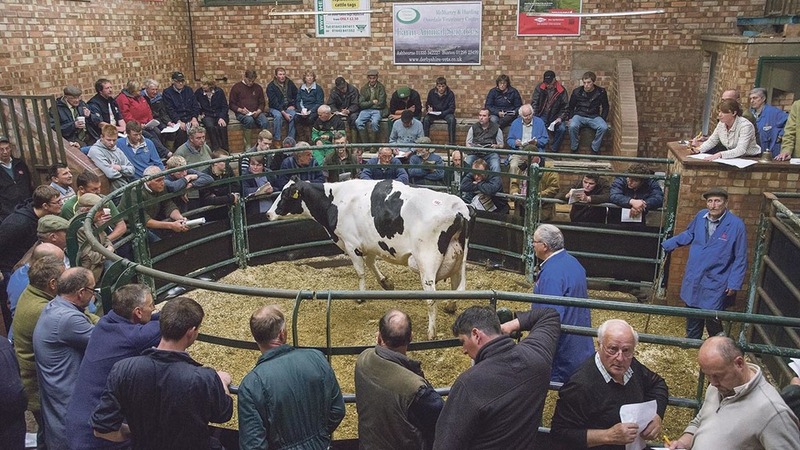 Prices were up significantly at UK auction marts for dairy cattle in March as markets recover from the lows seen last spring. March prices for freshly-calved heifers rose 16 per cent to £1,283 compared with last year and freshly-calved cows rose 15.5 per cent, to £1,017 per head. But Clive Norbury, auctioneer at Beeston Cattle Market, said he believed the increases were down to markets reaching a low last year, rather than a big boost in prices for 2017. Mr Norbury said March 2016 was ‘awful’ and the best were currently selling quite well but the underlying market signals were ‘not great’. “At the moment, it is not bad, but it is not brilliant either,” he added. Glyn Lucas, auctioneer at Carlisle, said the mart had seen good numbers and prices at all of its recent sales. “It is quite encouraging. It does look like demand is very strong,” he said. Both auctioneers highlighted cull cow prices were ‘extremely good’ at the moment, which could mean farmers were concentrating on selling into those markets. “People are continuing to cull cows very heavily,” Mr Lucas said. Going forward, Mr Norbury warned the markets were dependent on what happened with milk prices, with processors announcing price drops or holds in recent months. “Markets are very volatile and prices are coming down again,” he added.